A giant inflatable chicken intended to represent President Donald Trump was placed near the White House on Wednesday afternoon. The chicken sports golden hair and Trump-like hand gestures. According to The Hill, the object is based on a statue unveiled at a Chinese mall in 2016. Taran Singh Brar, who said he was the owner, told HuffPost's Philip Lewis the massive inflatable object was a visual protest against Trump. He reportedly purchased the chicken for $1,300 to call the president out for being "too chicken to release his tax returns" and to stand up to Russian President Vladimir Putin. Brar staged the chicken in The Ellipse, a park just south of the White House. @Josh_Moon I can't wait until Trump threatens the chicken with nuclear weapons or Tyson Foods. On Twitter. 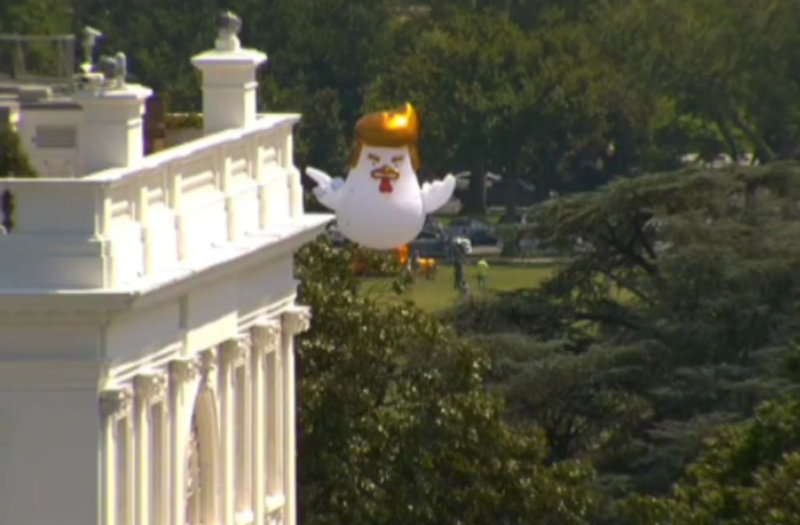 @nytimes @ananavarro @maddow @AC360 did you all get a shot of the giant trump blow up chicken in the shadow of the white house? Hilarious!!! @jaketapper 2 words: Trump chicken. @tomblappy Trump card's too chicken to even help Big Bird help refugees, no wonder there's a giant Trump chicken at the White House! "Good thing we're not in a nuclear stand-off with any countries, now to inflate this giant Trump chicken and take a big sip of coffee..."
That inflatable chicken just increased our chances of going to war significantly. Trump: "I ain't no shicken. I'll show you a shicken!" @onedaylight @bryan_conn @komonews It makes not one bit of difference. Trump is President and you've got a blow up chicken. Congrats! President Trump and first lady Melania Trump are currently out of town, vacationing at his New Jersey golf club.